The cold grey silence of a mountainside is suddenly broken by the abrupt appearance of an Apache AH-64 Apache as it bursts upon the scene in a rapid display of power and lethal capacity. A full compliment of Hellfire missiles, the "Heavy Hog" configuration, in no way impedes the swift and violent approach of what is regarded as the finest Attack Helicopter in the World. In an exceptional demonstration of beauty and strength, "Rising Force" portrays the Apache in a breathtaking Alpine setting, revealing its speed, agility, and mastery of any extreme. 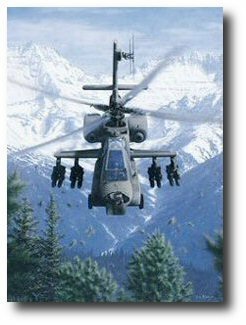 The Fourth in the Army Aviation Art Series by Dru Blair, and the final print in the Apache AH64A trilogy, "Rising Force" is reproduced on Acid Free Archival Stock, and each print is individually inspected and signed by the artist. "RIsing Force" is also available as a Giclée (pronounced "zhee-clay'), which refers to a 7-color print which utilizes the latest in digital technology to reproduce art with breathtaking accuracy. This is the largest and most expensive version of our print line, usually measuring an overall 42" inches wide, and printed on museum quality Hahnemuhle paper for $495. A near perfect replica of the original painting, Giclée prints are limited to only 50 examples of each image, and are created for the most discriminating collectors.